Last week, I had to skip my weekly #365dairyfree challenge update to give another dairy-free challenge some face time. But, I’m making up for it with a two-week progress update today and this lovely new spiced pear breakfast bread recipe from my kitchen. I’ve never been one to love super-sweet quick breads. I mean, they taste great, but they leave me feeling over-sugared; not the best thing since I prefer enjoying bread in the morning with tea. Instead, I usually bake lightly sweet, whole grain quick breads and top them with nut butter for a hearty start that’s just indulgent enough. 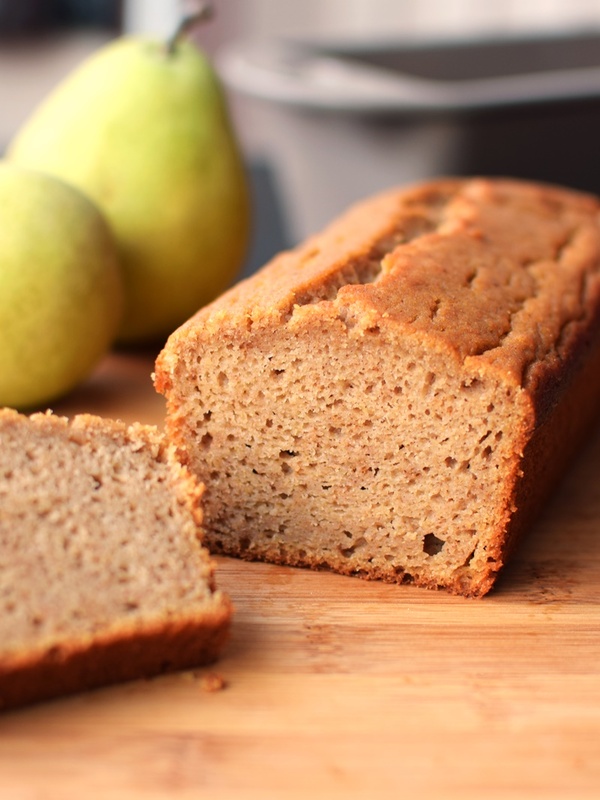 The idea to make a pear breakfast bread wasn’t exactly a stretch of the imagination – pears seem to be abundant and on sale all over town (even organic!). I always think of pears as an autumn fruit, but it turns out their peak lasts right through the cold spells of winter. That said, if you simply can’t find any that are ripe for the picking, this recipe will also work with your favorite sweet apples. I’ve been enjoying each slice of this pear breakfast bread with a slather of almond butter and a big mug of tea, but if you prefer, it also goes great with a schmeer of buttery spread or a drizzle of your favorite sweet topper. This Spiced Pear Breakfast Bread is a success from my personal 365 New Dairy-Free Recipe Challenge for 2016. My goal is to trial at least 365 new-to-me recipes this year, and that doesn’t even count all of the retesting I am doing to perfect many of those dishes. I’ll be using the hashtag #365dairyfree here and on social media to share many of the trials, successes and flops! For a more elongated shape with petite slices, I used my Revol Les Naturels Loaf Pan (pictured above and As Seen in Williams-Sonoma) to test this pear breakfast bread. It’s longer and narrower, but is roughly equivalent to an 8×4-inch loaf pan. I prefer this high quality ceramic for baking, but it does retain heat longer once removed from the oven, so the loaf will continue to cook a touch until it is flipped out of the pan. By ingredients, this recipe is dairy-free / non-dairy, nut-free, peanut-free, soy-free, and vegetarian. I’ve not yet tested it gluten-free. If I did, I would use either just oat flour or a whole grain gluten-free blend, and I might add either another egg or some xanthan gum (perhaps 1/2 teaspoon) for binding. Tony isn’t big on pears, so I wasn’t inclined to test a gluten-free version this time around! 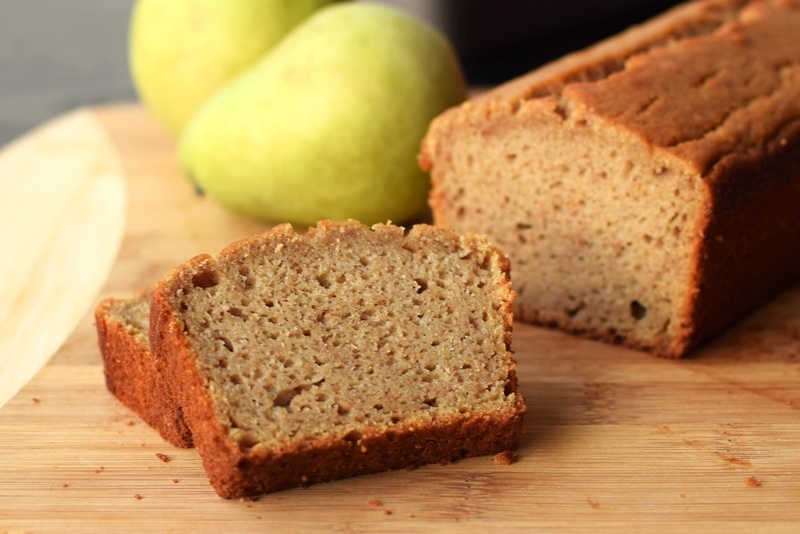 For vegan pear breakfast bread, you can swap in your favorite egg sub for muffins. 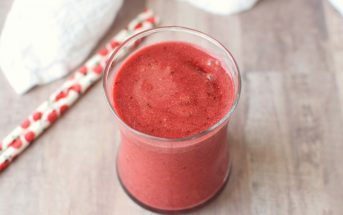 Since this recipe is heavy on puree, I would lean toward a powdered egg replacer, but I think a flax egg, chia egg, or simply just 2 to 3 tablespoons more pear puree should work well. 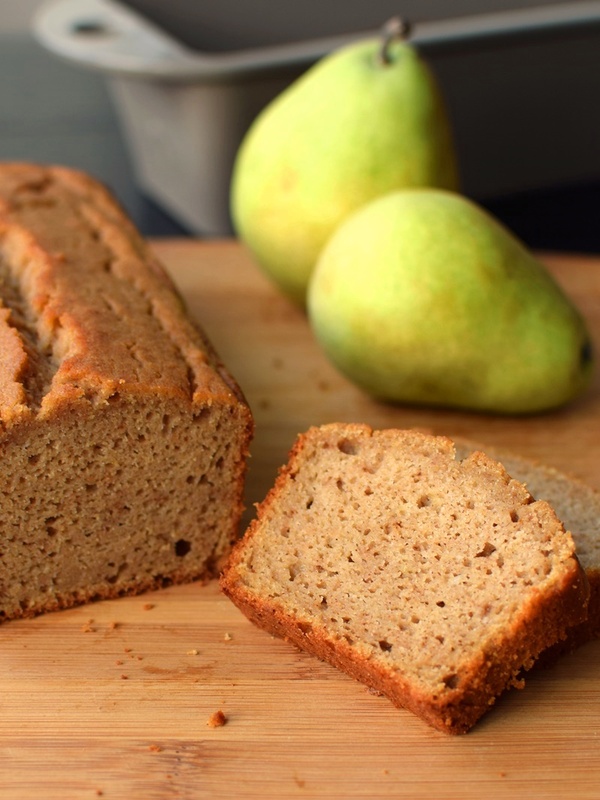 For the naturally sweetest breakfast bread results, use Bartlett pears. If not available, ripe Anjou pears are a good option. The results are still just gently sweet; if you prefer a sweeter pear breakfast bread, add ¼ cup brown sugar or coconut sugar with the liquid sweetener in the recipe. Grease an 8x4-inch or 9.5x3.5-inch loaf pan (I use this one), and flour the bottom. In a medium bowl, whisk together the flour, baking powder, cinnamon, ginger, baking soda, salt, and cloves. In a large mixing bowl, blend the oil, liquid sweetener, egg, and vanilla until just combined. Stir in the pear followed by the flour mixture. Stir just until combined; do not over mix (a few little lumps are okay). Spoon the batter into your prepared loaf pan and even out. Bake for 45 to 55 minutes (I'm at 4500 feet / dry climate and 50 minutes is spot on), or until a toothpick inserted into the center of the loaf comes out clean. Let the loaf cool in the pan for 15 minutes or until cool enough to pick up. Gently remove the loaf from the pan and cool it completely on a wire rack before slicing. Tightly wrap and store any leftovers at room temperature for up to 2 days, but chill in the refrigerator or freezer if you want it to keep longer. *White-wheat flour (I use Bob's Red Mill Ivory Wheat Flour) is actually 100% whole wheat / whole grain, it's just made from a softer type of wheat than traditional wheat flour and produces more tender muffin and quick bread results. If desired, you can use all-purpose flour instead. **Tip: Measure out the oil first in a ¼ cup then use that ¼ cup to measure the liquid sweetener - it will slide right out! YUM!! Just made these and they turned out SO good! Just the right amount of sweetness and so light and fluffy. I used coconut oil for the oil and followed the recipe as written for the rest. So good! Wonderful! So glad you enjoyed it Johanna! Awesome! I’m so glad you enjoyed my recipe and thank you for sharing your successful vegan substitute! Can this be made with 1:1 gluten free flour? Thank you. It might work well Des, but I haven’t tested it yet. Ooh this looks like such a cozy way to start the day! Looks moist, tender, and tasty. I love fruit-based quick breads. Great with tea in the morning. That’s exactly how I’ve been loving it Susan! Looks absolutely delicious! 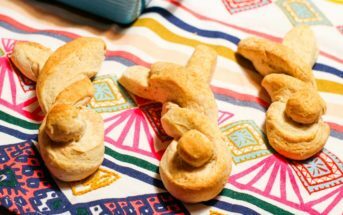 I used to make bread each week as a snack or for breakfast but got out of the habit. Time to get back to it! Definitely is! So perfect with nut butter in the morning. You know what maybe if I set myself a challenge like that I would actually get in the kitchen and make more of the recipes I keep thinking about…ok you’ve got me inspired. This bread looks so moist, I may have to put it on the list!! This bread looks PERFECT! And talk about a fun flavor! Great job on the challenge. You are doing great! Thank you Katie – I’m trying! Not quite in the rhythm yet, but it’s still early. It should work, as long as you add some structure Elizabeth. Like an applesauce bread, it has pectin from the pear, which helps a little. I’ve never made bread with pears but I can imagine that it tastes wonderful. What a lovely combination of spices you used in this recipe too. Nothing bets homemade bread! I can only imagine how amazing it smells and tastes. All the ingredients are fantastic, love maple, cinnamon and pears. I have to admit I posted a pear and beetroot bread last year. Beetroot!? How unique and delicious I bet!